Taxi Driver - Mr. Lelo #9 - "Our Belize Vacation"
Mr. Lelo and his wife own a taxi business in San Pedro and have been living on the island for quite some time now. During the day, Mr. Lelo drives his taxi in and around town, while Mrs. Lelo makes school lunches for Island Academy. You might find this story amusing. I mistakenly placed a $100. bill in my kids school lunch piggy bank. the other day. Lauren (in Kindergarten), as usual, went to get her school lunch money prior to leaving for school. She simply grabbed one of the bills, that I had placed in her piggy bank for the week. Later that morning, when it came time to eat, Lauren paid Mr. Lelo (for her school lunch), by handing him a $100. bill. A little stunned and very surprised, Mr. Lelo went to the school administration at Island Academy to inform the staff what had just happened. Lauren was given a lunch, and my $100 bill was returned to me by Mr. Lelo. So you see why now, Mr. Lelo has two thumbs up in our book. He's not only honest, but he and his wife make one mean school lunch. 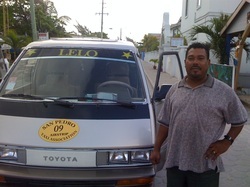 If you find yourself in San Pedro, and need an honest taxi driver.................ask for Mr. Leo.